Much respect to Mrs. Smith for speaking out. As much of a fan as I am of her husband's, it would probably take voodoo or the end of the world for him to thoroughly speak up about racism and inequality sadly. Same as Dwayne Johnson and many timid others in the public spotlight. 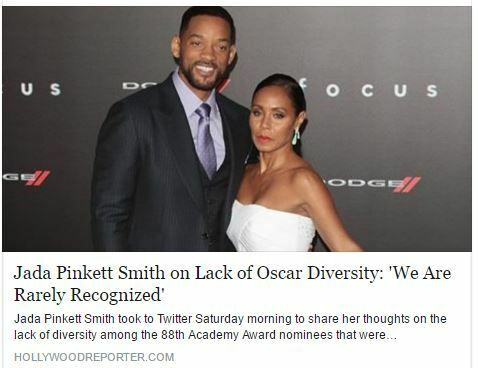 Anyhow, what she had to say is most definitely true - at least from my perspective and from what I've observed: Hollywood has no problem with blacks and other people of color when the job requires cooning and entertaining but when it comes time to diversify and give credit where it's due, you'd be hard-pressed to find an established awards staple where - outside of a select few tokens in the past - all ethnicities and other historically-disregarded demographics are consistently treated with the same reverence and respect as the majority of their white counterparts are. Respectively, as a black man and as a storyteller, I feel that all perspectives need to be shared through politics, activism, and art alike but most especially through art because when all is said and done: Art is the only thing that current generations leave behind for future ones to learn and build from. So, what's the message that the 2015 and 2016 Oscars say to future generations about the current state of filmmaking and largely about people of color in general? Not anything too positive. And that is alarming considering that although awards aren't vital to life, they're vital to the quality of morale across the board in more ways than most people take the time out to ever truly think about. Images matter, they matter a lot actually, and that's the reason why contrary to what the dissenters may say: People of color are not asking to be catered to, we're simply just requesting our fair due for our work.